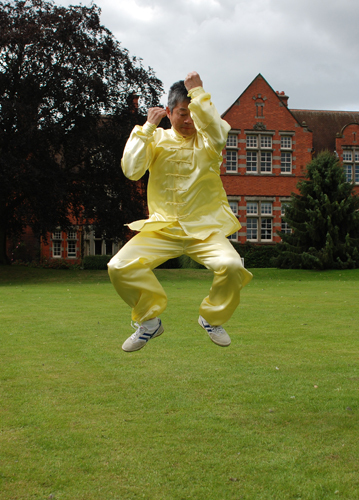 Chen Style Taijiquan 陳家太極拳 has only two forms, one is slow and gentle and the other is fast and powerful. they are called Yi Lu —路 and Er Lu 二路. Yi — means one and Lu 路 means road, but in this context it means a set of movements. So Yi Lu means First Form. This form is gentle and slow. Er 二 means two and so Er Lu means Second Form and this form is fast and powerful and because of this it is also known as Pao Chui 砲捶 which means Canon Fist (so it is as powerful as a canon). The two forms balance Yin and Yang, the two elements of nature. When studying everybody starts with Yi Lu – gentle and slow. Once we are good at the gentle and slow movements and all the detail is clear then we can move on to Er Lu, which is fast and powerful. This is balance; just like in nature where animals begin to grow they do so slowly and gently so that their body and structure can form properly. Once they have reached maturity they can be fast and powerful, and of course, when they grow old they go back to being slow and gentle and this is the principle of Taiji 太極.